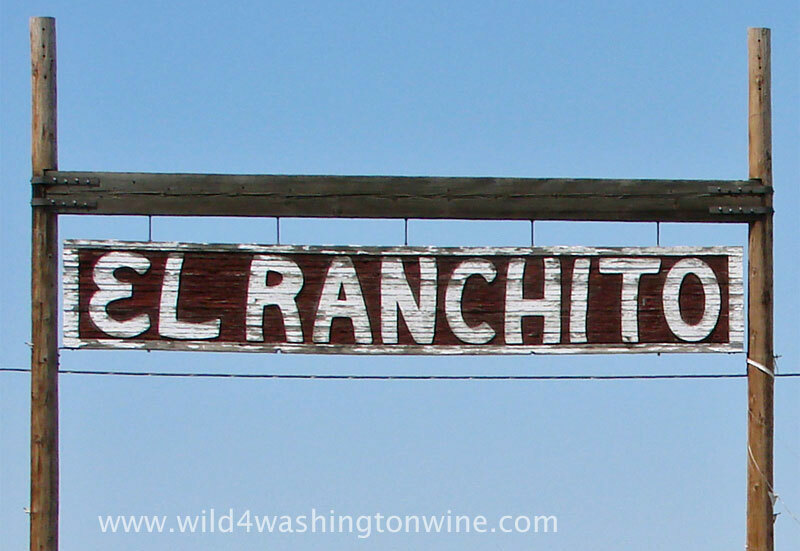 An Impulsive Tasting Trip to Zillah, Washington. The glorious sunshine has returned to the Columbia Valley. Finally, spring has arrived. This perfect, hopefully not temporary, weather had me yearning to get out of town yesterday. Hitting the road impulsively, I found myself enjoying the drive and the tunes, before I knew it, I was exiting at Zillah. 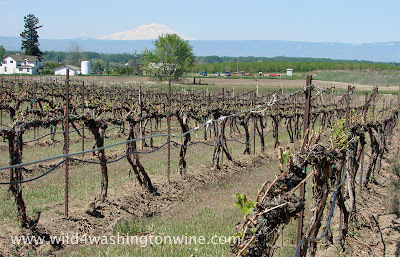 Bonair Vineyards with view of Mount Adams. Zillah is a small community in the Yakima Valley; Bonair winery is located in the Rattlesnake Hills AVA, one of many wineries in the area. 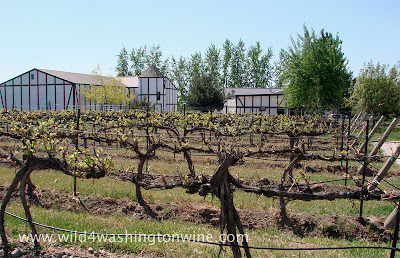 My last visit to Zillah was in 2007, I was attending Two Mountain Vineyards “Vineyard Management” class taught by Matt Rawn. 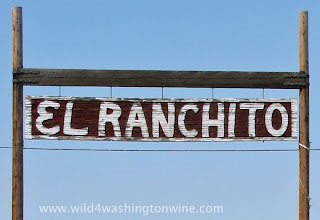 Feeling a bit peckish, and craving carnitas tacos, I went to my favorite Zillah restaurant, El Ranchito. To my disappointment, I found El Ranchito empty, closed, shut-down, and out of business. What a shame. I have fond memories of eating and shopping there. It’s been a while since I visited. Feeling a little down, I navigated road construction and detours, eventually settling for some fast food. If any of you know of a good place to eat in Zillah, I welcome suggestions - please leave a comment. Hunger dealt with, I headed down the road to go wine tasting. My first stop was at Bonair Winery. It’s been a long time since I visited Bonair, about 15 years. As you drive down the dirt road to the winery, you get the pleasure of driving past their vineyards. I saw some green on those vines. Since my last visit, the winery has expanded; they built a new tasting room and added a duck pond. One of the original buildings is now used for events and for educational wine tours. Bonair vines and original buildings. As I pulled in to the winery, I passed winemaker Gail Puryear heading down the road, in the opposite direction. Oh well, maybe next time we can visit. I must mention that I do like reading “The Grumpy Winemaker” blog, written by Bonair winemaker Gail Puryear. Gail can be a little grumpy, but he has refreshing views on the Washington Wine industry, which makes for an enjoyable read. The heading of his blog reads, “After 30 years in the Washington wine industry, I think it is time from some of us old timers to speak up. I will try to be enlightening and philosophical, but I might be somewhat grumpy at times. There will be current as well as historical perspectives on the Washington Wine Industry. The views expressed here do not reflect the views of Bonair Winery, Inc. For those views, talk to Shirley, my wife.” Check it out here. Gails’ lovely wife Shirley was manning the tasting room. She’s a great hostess, with plenty of stories to accompany each wine. 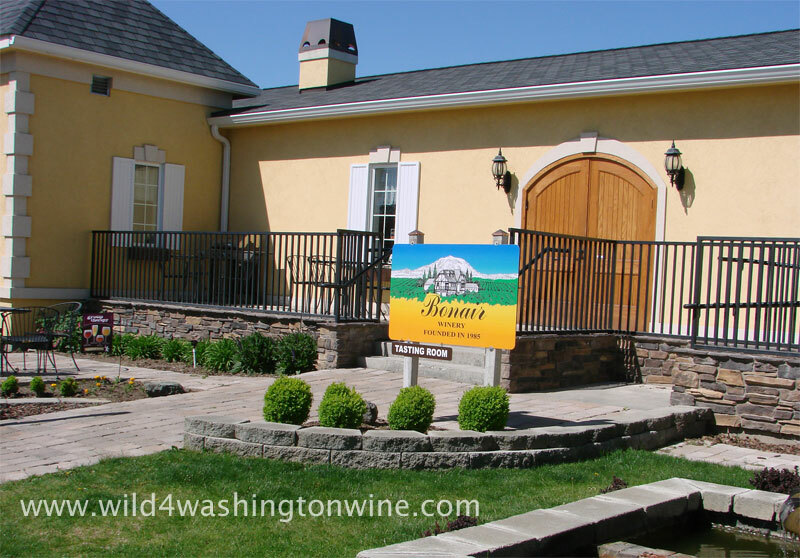 Bonair winery has a complimentary tasting of four wines (that reads “free”) and a $5 tasting fee to sample the reserve wines. Of the wines I sampled, my favorite wines were the Reserve Chardonnay – restraint with sexiness, the Cabernet Franc – my spicy friend, the Malbec – bright and looking for companions, and the Merlot – rich and luxurious, leaving a trail of purple happiness down my tongue. Bonair Bung Dog - red wine. My impulsive Bonair winery visit was a bonafide pleasure. The wines were very enjoyable and the visitors who joined me from Bainbridge Island, Kirkland and Kentucky, were excellent companions. 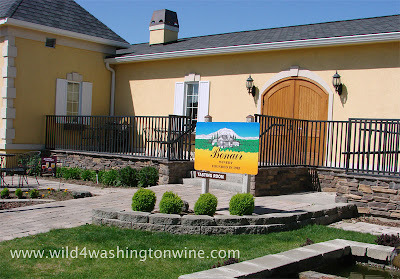 The next time you are traveling through Yakima and Eastern Washington, stop by Bonair Winery in Zillah. Recommended. Tasting room is open 10 am to 5 pm daily. Winery tours are $10 per person. Vineyard tours are $10 per person by appointment. 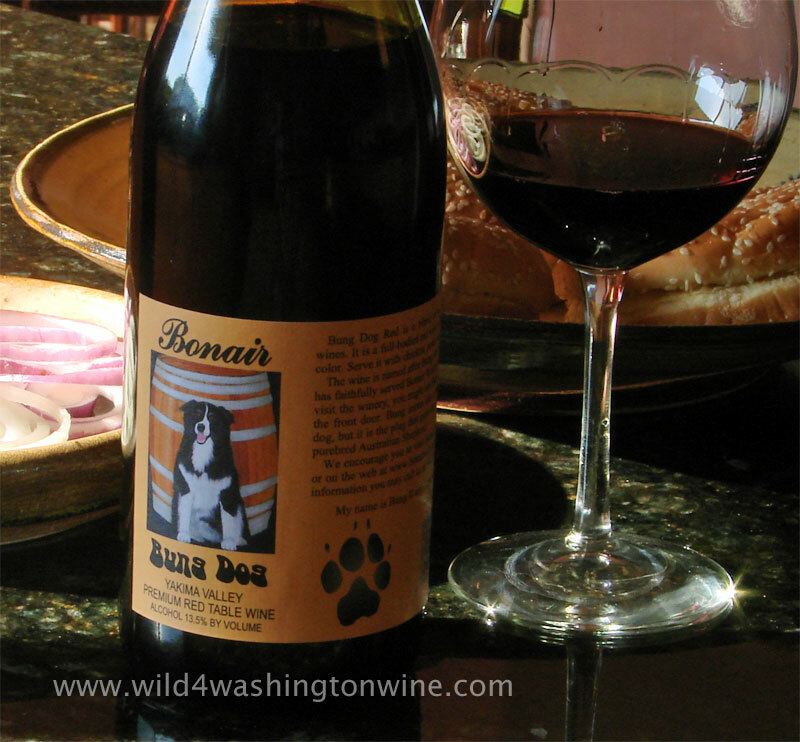 The best place to eat in Zillah is the Tapas at Bonair Winery. This is by far the best winery to visit. Shirley and the rest of the staff are great. Bung dog always greats you. And, if you bring Gail some oysters (in season only) or prosciutto you have a good change of breaking through his grumpiness.